October Schwartz is a nerdy, goth, high school girl who has five dead kid friends. They are ghosts, only she can see, from different periods of Canadian history. October and her friends are working through solving each of the ghost kids’ murders. In this book 4, they are solving Tabetha Scott’s murder, who escaped slavery with her dad, along the underground railway in the 1860s. 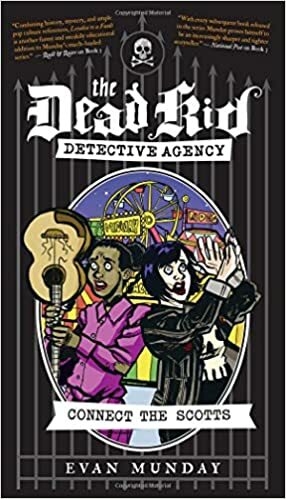 Throughout the book, the author presents racism – Canadian racism - in an astute way, squeezing serious literary content into a fast paced plot, including Scooby-doo type chases and running from dogs and evil football players - I love that the popular clique are the bad guys! I’m looking forward to the next book, and future projects by Evan Munday. Libraries across Canada consistently request books for all ages in fiction and non-fiction by indigenous authors and/or about indigenous characters. This book fulfills both criteria. The author of this book is a member of the Misipawistik Cree Nation, north of Winnipeg. His book is the first in a mystery series, set on Windy Lake First Nation. Four inseparable cousins – nicknamed the Mighty Muskrats – overhear their uncle from the Windy Lake Police Service talking about a visiting archeologist. His boat was found but he is missing. The Muskrats decide to investigate. 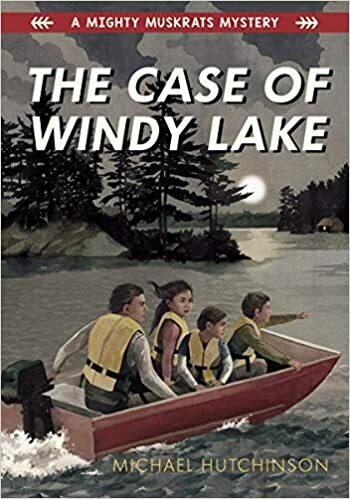 Their relationships with a wide range of people in Windy Lake helps them to piece together where the archeologist might have been, but it’s their own knowledge of Windy Lake and its wildlife that solves the case. Concurrent with their investigation, the four cousins are obedient, respectful kids, doing chores and running errands for their grandfather and uncle. Also during their investigation a fifth, older cousin is involved in a protest. She engages in civil disobedience regarding a company she feels is endangering Windy Lake’s water. During her protest she gains a better understanding of the company’s perspective, or at least, the perspective of its workers. I think that’s an interesting decision by the author. This book shares what life for these kids is like. Depending on the reader, it’s a window or mirror they will welcome. For me, I learned a few things, and look forward to reading more in this series. This author was signing at OLA Super Conference and a colleague picked up a copy for me. The book takes a minute and fifteen seconds to read, but will take about twice as long if you do all the different kinds of stomping! Many librarians have asked for exactly this kind of book, which is why we selected it for our Winter Bestseller List (It’s shipping in early March). 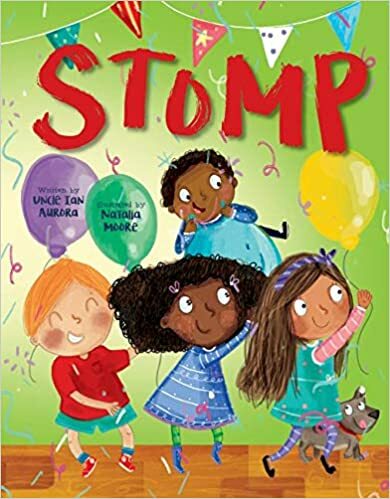 I imagine this book would work really well to get fidgety kids under “control” in the sense that they would at least be stomping when they’re supposed to be. It might become a favourite to start or end EVERY story time. The author’s 2016 book – Clap - is still available, as well. ARP libraries, please let me know if you’d like a copy or copies. This is a really fun and clever picture book. 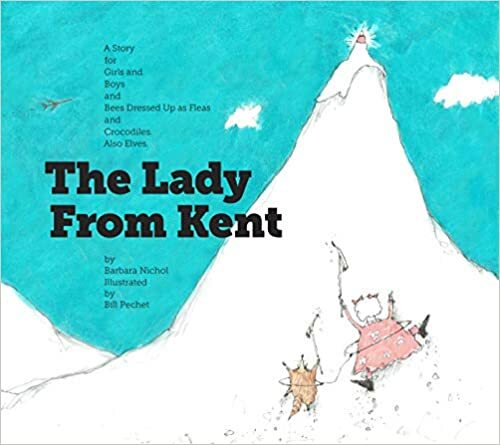 Though the rhyming narrative works read from cover to cover, each two page spread has a title and is a stand-alone poem and one of the lady’s stories. One could read the first spread, a sampling of a few stories, and the last spread, and it would make sense. Each reading could be different. Or one could read just one of the stories, and carry on the next night, or story time. The CBC’s Eleanor Wachtel and author Linda Spalding both endorse this interesting and precisely crafted gem. The age range given is 5 to 95, and I agree! Our protagonist, who is never named, opens the story walking with her parents to an oncologist appointment. As she waits, she remembers different parts of the five years since her leukemia diagnosis. The illustrations and colours succinctly augment the text with emotional energy. For example, the smell of hospitals and drab colours on the walls are offset when the protagonist escapes home. She loves the smell of lavender. At home, beyond the scent of the lavender spray in her room the protagonist’s mother uses lavender products everywhere, bath water, sheets, etc. Our still gray protagonist is cozy in these scenes surrounded by vibrant colour and images of plants and leaves and even the protagonist’s mother is more colourful. It’s a pretty beautiful metaphor of her mother’s love. Lavender is dear to my heart, particularly as an essential oil. It’s especially pleasing to me that the protagonist is comforted by this scent. 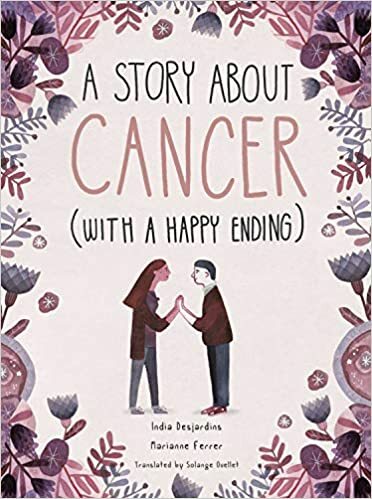 This 96 page illustrated novel deals with the feelings as well as the logistics of diagnosis, the death of a friend, being a patient with a possibly terminal illness, relationships, etc. Our protagonist even falls in love. It might be challenging to place this book in your library, but I urge you to welcome it. The publisher pegs the age of this book at 10-14. We feel it fits best in the young adult section of our LBI KIDS Bestseller list, even though normally we would place that age range in juvenile fiction. We did this for reasons already given, as well as the fact that the protagonist is 15 years-old for most of the narrative. I’m interested to know where you would put this book in your library. It’s scary to be diagnosed with cancer. I think this book could be a short, comforting, empowering read for a teenager facing this dragon. It could work for adults, as well. Canadian Michael McCreary introduces himself as a stand-up comedian who is also on the Autism Spectrum. In his book, he explains parts of his life that were important to becoming a comedian. He also explains how his autism spectrum has affected him at different times in his life. He writes very well, and candidly. His first “romance," for example, was pretty embarrassing, in a cringe-worthy way, and exaggerated by language miscues. He narrates what happened to him at different times, and points out how a neurotypical person would not – probably – have made the mistakes he made. I learned the word neurotypical from this book, and a lot about ASD as it relates to the author, which is his stated goal. He has succeeded very well! This is a really accessible, engaging, often laugh-out-loud funny, but sneakily informative book. To me, it’s a window into his world. For someone on the spectrum, it’s a rare and invaluable literary mirror. 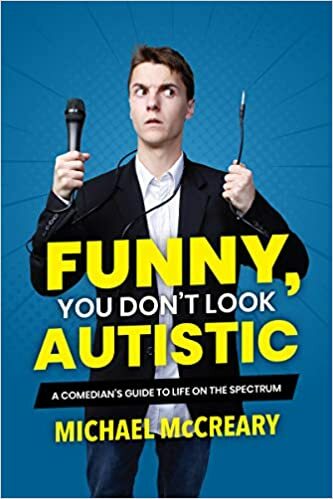 Because of this book, I’ve learned a little bit, and am also going to try to see some of his comedy! I highly recommend this book and urge you to make room for it in your library. 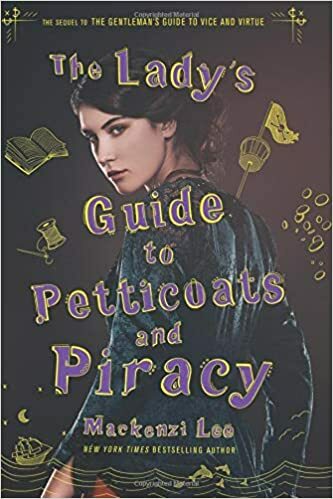 Our heroine, Felicity Montague, is described as wanting to become a doctor, womanly wiles – blah, blah, blah, so one really doesn’t expect so much action… but, I’m getting ahead of myself. Felicity’s story begins when her employer - to her narrowly suppressed glee – accidentally cuts himself. She’s pleased because the wound requires stitches and she’s been reading voraciously about how to do stitches and wants a chance to practice. (In an anticlimactic side-note, she’s disappointed to find the cut isn’t serious). In her world of the 18th century, women aren’t admitted to medical school and she’s been rebuffed at every turn. Her attempts to enroll lead her to a recently estranged friend’s wedding, where Felicity hopes to meet the groom – a doctor she admires. Her plan of how this meeting might in any way lead to an apprenticeship proves a moot point when her friend, the bride, suddenly flees the morning of the wedding. Felicity follows... and we follow into a WONDERFULLY unpredictable plot. Felicity’s wit and many of the conversations are extremely quick and funny. All of the characters are engaging and well-drawn, especially Sim, one of said pirates from the title. Sim’s interest in Felicity and Felicity’s disinterest in romance (her asexual nature) add to the suspense of the book, but don’t take away from the dragons. YES! Dragons! We don’t even have time to talk about them. I cannot wait for the third book in this series. I didn't read the first but had no problem in following the plot. Recommend this book to fans of the adult and YA Gail Carriger series, particularly the adult series the Custard Protocol.